"Tom Wilson #43 of the Washington Capitals celebrates after scoring the game-winning goal against the Toronto Maple Leafs in overtime in Game One of the Eastern Conference First Round during the 2017 NHL Stanley Cup Playoffs at Verizon Center on April 13, 2017 in Washington, DC." Photographing hockey can either be extremely clean or cluttered - rarely anything in-between. What I mean is that remote cameras above the ice can help photographs be very symmetrical and on an attractive canvas. Conversely, at ice level, the boards are littered in advertisements. This can make a great picture distracting due to logos or even colors of them. In addition, the crowd and railings on the steps can also take away from a great moment. But there are instances like the above where a simple crop can help communicate the story. 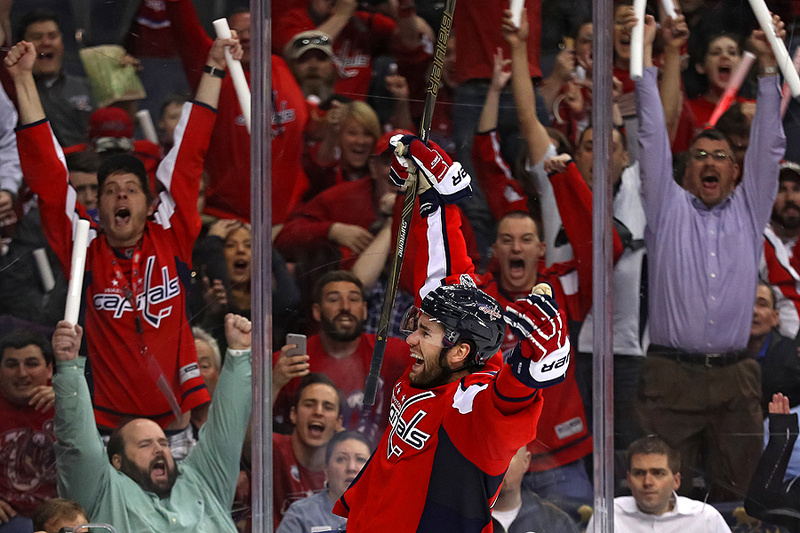 During Game One of the Eastern Conference First Round, Tom Wilson of the Washington Capitals rocketed the game-winning goal against the Toronto Maple Leafs in overtime. Being across the ice, I was on the play, yet crossing players, the goal itself and my limited angle through the hole made the image a challenge to get perfect. But all worked out in the end as Wilson and fans threw their hands into the air in jubilation.